Calibration and Certification Services	Precision Balancing Company, Inc. provides both balancing machine calibration and certification services for our customers’ balancing machines. Shop Balancing Services	In-house balancing for parts weighing from 0.1 lbs - 20,000 lbs and from 2" - 300" long using 9 Production balancing machines that are ISO certified by an independent facility and NIST traceable. Reconditioned Balancing Machines	We offer one of the largest selections of reconditioned (used) balancing equipment in the industry. We carry all makes and models, vertical and horizontal machines, in a wide variety of capacities. Our extensive experience will help you with your next balancing or balancing machine repair or service project! Precision Balancing is a 3rd generation, family owned and operated balancing service provider. Established in 1959 we offer over 50 years of combined balancing experience to handle even your most difficult balancing projects. We specialize in providing balancing service in one of our 9 production balancing machines, balancing machine calibration, repair and electronic upgrades, as well as being the oldest reconditioned balancing machine dealer in the US. 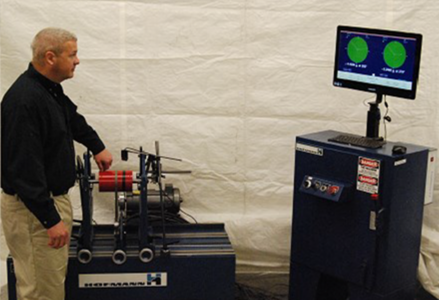 We deal with and provide calibration and service on all major brands of balancing machines including American Hofmann, Balance Master, Balance Research, Balance Specialties, Cemb, Schenck, Stewart Warner and many more. Please contact us today and let us help with your current balancing or balancing machine service needs.